The computer whizzes at the University of Bristol have made a giant machine to show you how a computer works. And when we say giant, we mean it – it measures over 8 square metres! The Big Hex Machine is a fully functional 16-bit computer. 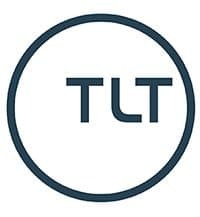 The designers aspire to expel confusion and make the fundamentals of computer architecture that little bit easier to comprehend. The machine is primarily targetted at students so it can be used as a physical aid to their learning. David May (pictured right, above), Professor of Computer Science in the Department of Computer Science (pictured right, above), designed the Big Hex Machine with education in mind. David says, “You cannot understand how a computer works by taking one apart! The Big Hex Machine is mounted on a wall for all students to see. 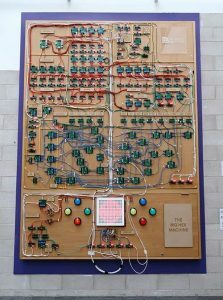 It has been built out of over 100 specially designed four-bit circuit boards to show the complexity of computers on a grander scale rather than the ordinarily minute versions. 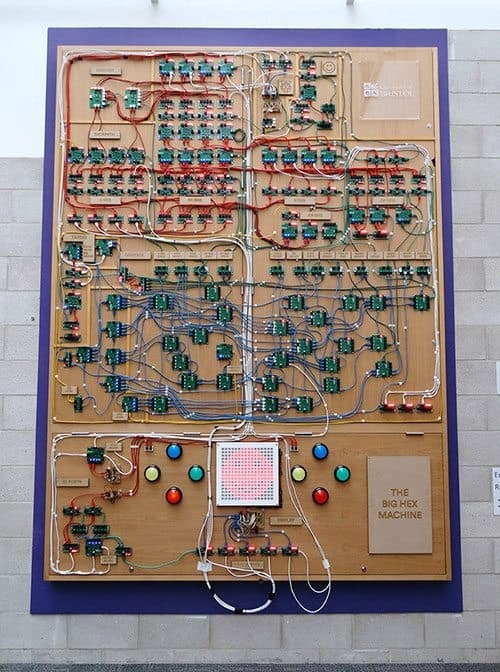 The Big Hex Machine has all the normal components of a computer: a processor, input and output devices, a custom-built LED matrix, a web-based application to control its operation, and a complete toolchain for students to write, build and execute their own software. Those who worked on the project said it was a very rewarding experience. 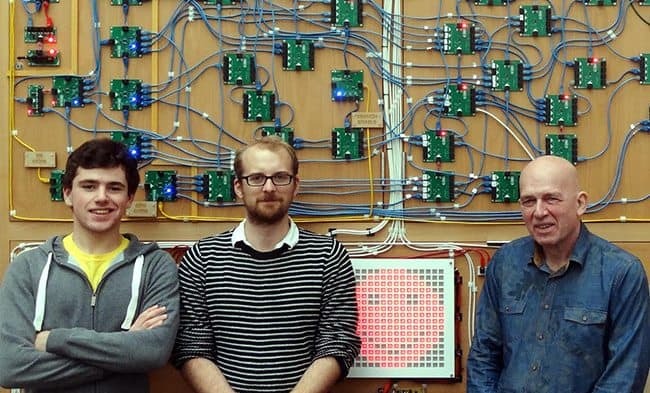 Richard Grafton, Senior Creative Teaching Technologist in the Department of Computer Science (pictured in the centre, above), comments, “Building such a machine was not a trivial task. Students at the University of Bristol also contributed to building the Big Hex Machine. Sam Russell, a third-year student who worked on the project (pictured left, above), adds, “It was exciting for me to almost cast myself back to the problems encountered by the original computer-building engineers. The official unveiling of the machine will take place at an event later this year – keep your eyes peeled for more details on this soon!